A flat topped earthern barrow with a diameter of 16.8 m. and a maximum height of 2 m.
English Heritage, in the FMW report, describe the round barrow as a gritstone cairn 14.5m N/S X 14.5m E/W X 2m high with slight (old) hollow in the top, slight platform to S edge. Crest siting on narrow ridge. Possible old scoop pits around the base of cairn. 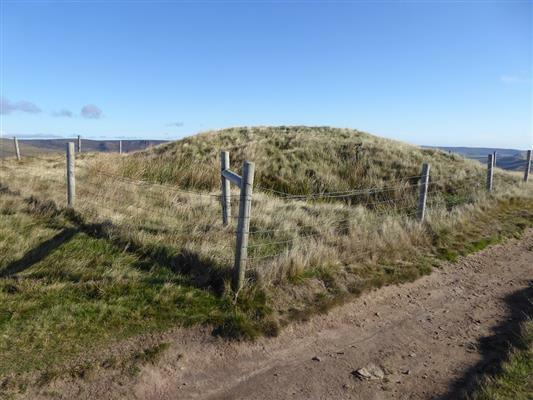 [1-3 ] The feature was visited by N.T archaeological survey team in 1986, who record that the barrow is close to the heavily used ridgetop footpath and is suffering from erosion as walkers use it as a viewing platform. It's position at the break of the slope means that is the first view over the Edale valley for walkers going east. From the records it is unclear if the barrow has been excavated, Bateman (an antiquarian who excavated a large number of barrows in the 19th century) mentions the Lord's seat which may be a indication that the barrow has been excavated, the slightly dished top may point to an excavation although much of the wear is almost certainly due to erosion. The earlier O.S 6 inch editions and 1/2500 plans show a flagstaff on the crest of the ridge. This was for a warning flag as there was a rifle range in the valley below on the Edale side from at least the 1920's until the Second World War. They also show a sheepfold in the corner formed by the ridgetop wall and the wall which ran north from this but is now severely robbed out. There are a number of shallow quarry pits along the line of the ridge top wall. [4-5] It is understood that this barrow was surveyed by the Peak National Parks Archaeologist in 1990. It is necessary to stress that the heavily used ridge-top path is eroding into the southern side of the barrow (1992). In 2015 an archaeological survey was undertaken of the barrow by ArcHeritage. As part of the work a topographic survey of the monument was done, which included a number of scanns used to create a 3D model of the barrow and its immediate surroundings. A condition survey of the barrow was also undertaken, and comprised a sketch plan, notes and digital photographs of the feature, with evidence of erosion, as well as more general photographs of the site and its setting. This work resulted in a Conservation Management Plan, advising that the restoration of the turf on the top of the barrow to avoid any further erosion or damage to the remains within the barrow. Furthermore, a series of management policies were proposed, as well as actions to conserve, manage and enhance the understanding of the site. SNA67038 - Conservation Plan: ArcHeritage. 2015. Lord's Seat Barrow, Edale; Conservation Management Plan. SZE14905 - Photograph - black and white: 09/04/1992. Lords Seat Round Barrow, Edale, High Peak Estate. 0.5. SZE14906 - Photograph - black and white: 09/04/1992. Lords Seat Round Barrow, Edale, High Peak Estate. 0.5. SZE23587 - Photograph - black and white: Harry Beamish. 01/09/1986. Lords Seat Barrow, Edale, High Peak Estate. 0.5 M. 25. SZE27122 - Photograph - black and white: Harry Beamish. 01/09/1986. Lords Seat Barrow, Rushup Edge, Edale, High Peak Estate. 0.5 M. 26. SZE48200 - National Trust Report: Mark Newman. 2000. Memo arising from Site visit of 12/12/00. SZE8549 - Unpublished document: Beamish, H. 1986. The National Trust Archaeological Survey - Edale (High Peak), Derbyshire.